iTunes is a must have application software when using Apple products. It allows easy access and management of audio, video and lots more. By default, iTunes window will reside on Windows taskbar and even minimized iTunes tab will show on the taskbar. If you use iTunes application regularly, you can easily cleanup Windows taskbar area from iTunes tab by displaying it in the System Tray (next to Windows clock area). Best part, to minimize and show iTunes window in System Tray there is no install any plugin or special software – just need to customize a setting option in iTunes preferences. 1. Launch and open iTunes application program on your Windows computer. Default iTunes window should open. 2. Click Edit option in the top menu and then click Preferences option. Alternatively you can press Ctrl + , keys – this will open Settings / Preferences window. 3. By default, General tab content will be displayed. Click Advanced tab at extreme top right. 4. Check for options at the bottom. 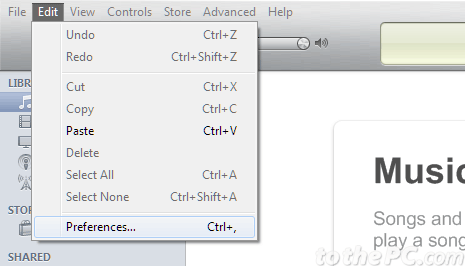 You need to click to check “show iTunes icon in the system tray” and “Minimize iTunes window to system tray” options. 5. Click OK to save new settings. Click minimize icon at top right of iTunes window. From now on, iTunes icon will show in the System Tray instead of taskbar. 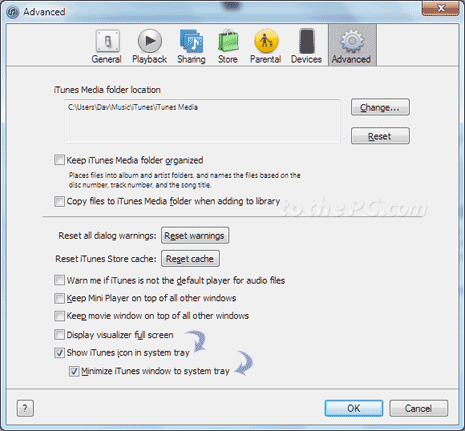 To open iTunes window from the system tray area, right click iTunes icon in system tray and then click Show iTunes option.